Abducent or Abducens Nerve is the 6th cranial nerve. Abuducent nerve is a motor nerve and supplies only 1 muscle, the lateral rectus of the eye-ball. It is named so because it abducts the eye. Abducent nerve is also known as fan’s nerve, because in ancient times (nonverbal age between the adolescent girls and boys), the boy utilized to call the girls from a party by sending signal via the actions of the Muscle. It is most vulnerable to damage of all the cranial nerves during raised intracranial pressure, functional parts and nuclei general somatic afferent fibres. They originate from the abducent nucleus in the pons and supply the lateral rectus muscle of the eyeball. General somatic afferent fibres carry proprioceptive sensations from the lateral rectus and terminate in the mesencephalic nucleus of the trigeminal nerve course, relationships and distribution. 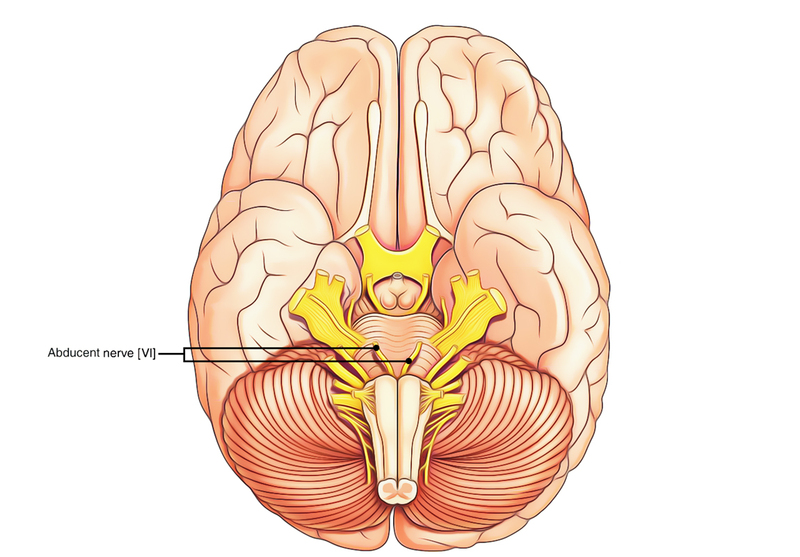 The abducent nerve originates at the lower border of the pons opposite the pyramid of the medulla. The nerve runs upward, forwards and laterally dorsal to the anterior cerebellar artery and pierces the dura mater over the clivus inferolateral to the dorsum sellae. It then goes through the medial wall of the inferior petrosal sinus and arches forwards directly over the sharp ridge of the petrous temporal bone, under the petroclinoid ligament and enters the fibro-osseous canal (dorello’s canal) created by the apex of the petrous temporal bone and petroclinoid ligament (gruber’s ligament). The nerve subsequently, enters the cavernous sinus by piercing the posterior wall near the floor of the sinus in the cavernous sinus, it runs forwards inferolateral to the internal carotid artery. The nerve enters the orbit via the superior orbital fissure inside the tendinous ring lateral to 2 sections of oculomotor and nasociliary nerves. In the orbit, it runs forward, toward the lateral side to go into the orbital surface of the lateral rectus muscle which it supplies. Convergent squint because of the unopposed activity of medial rectus muscle. Inability to abduct the eye. Diplopia (double vision) with maximum separation of 2 images while looking toward the paralyzed side.